As previous rumors have hinted, in designing the upcoming iPad Air 3 Apple has taken a lot of inspiration from the unique features it introduced with the bigger iPad Pro. 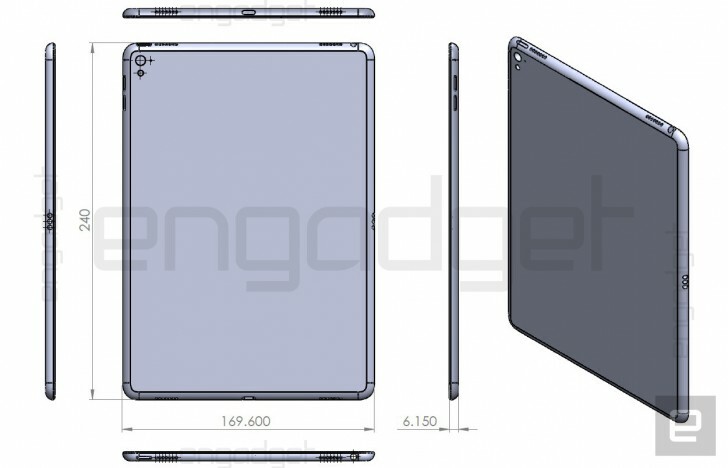 And today a new leaked drawing which purportedly shows the iPad Air 3’s dimensions and various cutouts seems to confirm just that. While anyone can create such a rendering, this is said to originate at a reliable source for what it’s worth. The iPad Air 3 is thus going to feature a quad speaker setup akin to the iPad Pro. Furthermore, it will borrow its bigger sibling’s Smart Connector, so we assume there will be a Smart Keyboard accessory for it available at launch too. The main camera will get a LED flash for whatever reason. The cost of all these new features will be seen in the dimensions of the device. It will be slightly thicker and wider than its predecessor, with the full measurements coming in at 240 x 169.6 x 6.15 mm. However, the differences are .1 and .05 mm, respectively, so you’re unlikely to notice them in real-world use. The iPad Air 3 will supposedly launch in mid-March alongside the new affordable 4-inch smartphone from Apple (which may end up being called iPhone 5se).